We need to create bridge from physical interface p37p1 to let virtual OpenStack nodes in KVM communicate with external network. 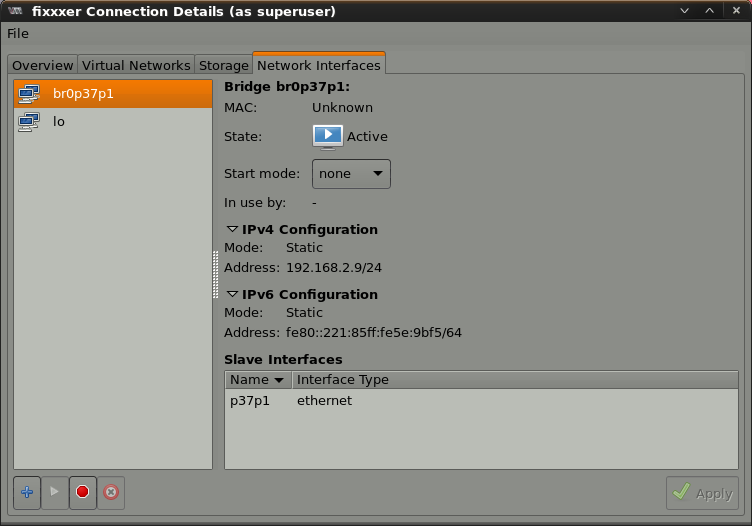 This Bridge will be attached to KVM OpenStack public network: pub_net. pub_net will be attached to 1st interface (eth0) on each virtual node. 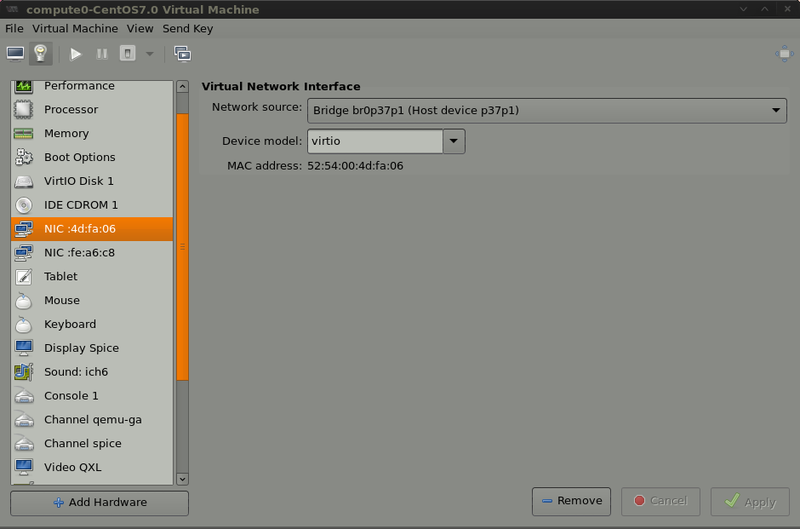 Note: Creating Bridge by means of virt-manager is probably fastest and easiest way of creating Linux Bridge. You could also create Linux Bridge by editing ifcfg-* files in /etc/sysconfig/network-scripts/ directory, but this is more complicated and not in scope of this article. Let’s create Virtual Network, which will be used as OpenStack internal network: priv-net. This network is isolated from outside world and its purpose is to provide physical connection (Carrier, ISO/OSI Layer 2: Data Link) between virtual nodes in OpenStack. 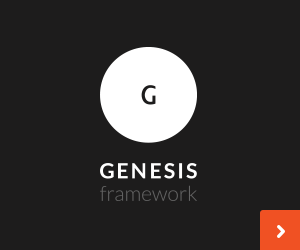 This network will be attached to 2nd interface (eth1) on each virtual node to provide an exchange of messages (Message Broker: AMQP, QPID) between them. It doesn’t need IP space assignment for OpenStack to work properly, we assigned it IP notification: 192.168.32.0/24 for troubleshooting purpose only, you can assign it any network you want. Along with Virtual Network creation, KVM will create virtual bridge: virbr0. 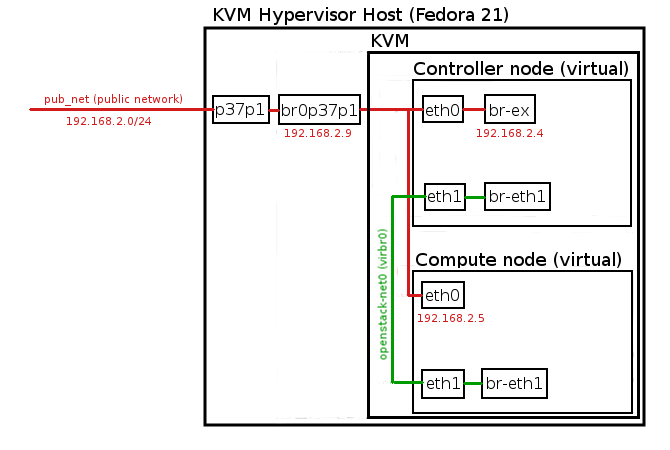 Both Virtual Nodes based on KVM Virtual Machines must have two network interfaces, one for external connectivity (eth0), second (eth1) for internal communication. 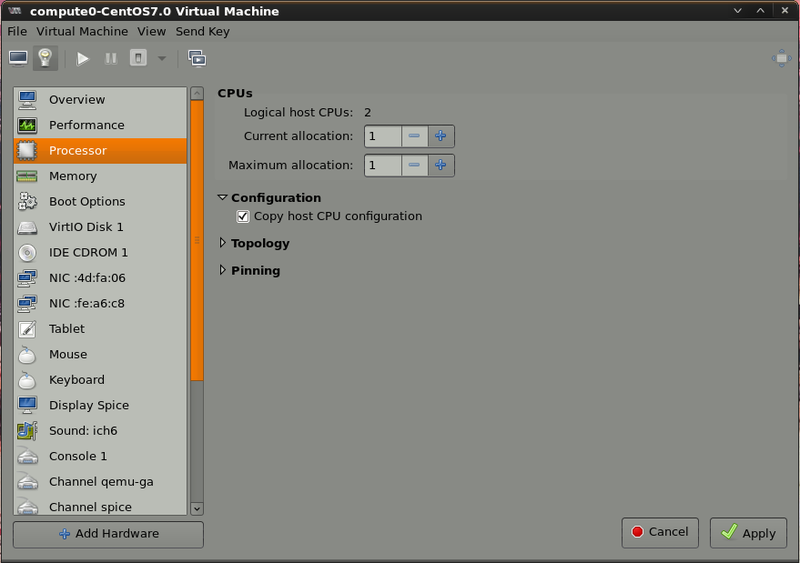 For OpenStack Virtual Nodes we will use CentOS 7.0 x86_64 system. 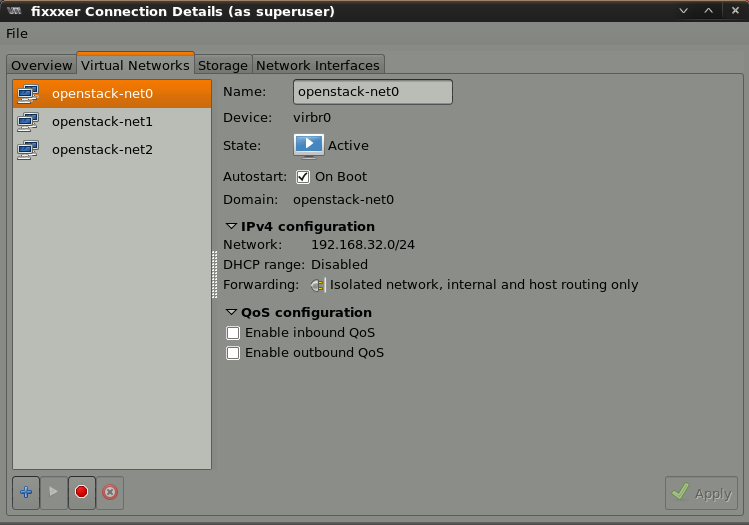 After both Virtual Nodes are installed, we can install OpenStack. OpenStack installation on KVM Virtual Machines looks exactly the same as installation on physical hardware nodes. 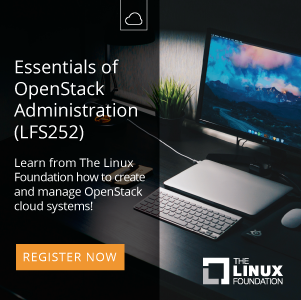 An example OpenStack Juno deployment is described under the following link: OpenStack Installation on CentOS 7 / RHEL 7.
would you explain or demo the multi region in openstack ? It will be great for you followers. Thanx for your request, I will consider it. I corrected the link, thank you for remark. The link leads to an OpenStack installation based on old and unsupported Juno release, because this is an old article. 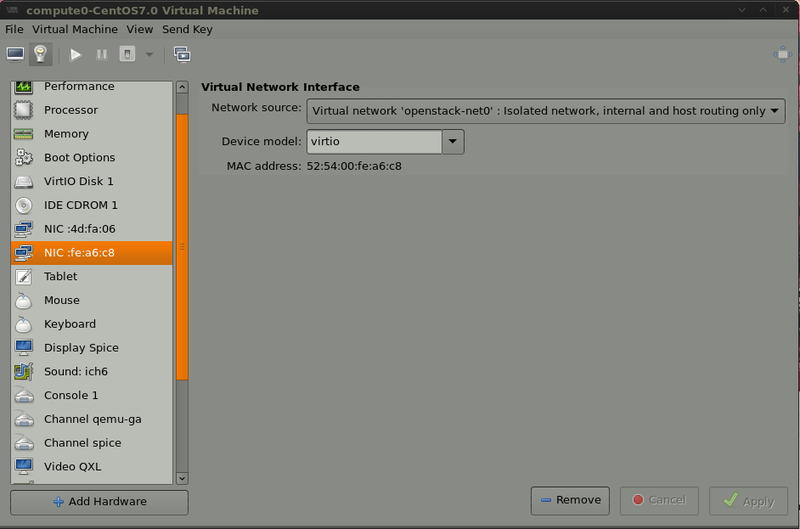 OpenStack Pike VLAN and Flat network based installation using Packstack. Don’t forget to extend RAM on the VMs accordingly as a newer release needs more RAM. I will update these details in the article soon to be more up-to-date.